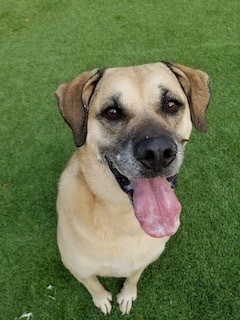 From the Trainer: Moxy is a sweet lab mix. She knows all her basic training commands and is an angel in the house. She can be left uncrated and won’t touch a thing. She is potty trained, walks well on a leash, and even knows her place command. Moxy LOVES to swim. She would do it every day if she could. She gets along with other dogs with proper introductions. At doggie daycare she is not a fan of big rowdy play groups, but gets along well in a mellow group. Moxy could live with another mellow dog. She can be shy when meeting new people but with a treat is easy to win over and before you know it she will be asking for belly rubs. Being shy with new introductions, living with kids under the age of 14 isn’t ideal. From the previous owner: Moxy is a great dog. One of the biggest hearts and loves to please. We had her for 4 years and she was great to our family, 2 boys, now 8 and 12. They were 4 and 8 when we got her. They love her and she loves them. Our lifestyle and time at home has changed a lot in the last 4 years. We are heartbroken to rehome her, but we know it is best for her long term and us. We are writing this to be sure her new forever home has all the details we learned over the last 4 years. If we could sum her up in a few words, it would be “play” “love” and “fearful/worried”. She takes a while to warm up, even with us to start, but soon was a big mush of love. Why are we rehoming her? It was not easy. We love her and tons of tears were shed. 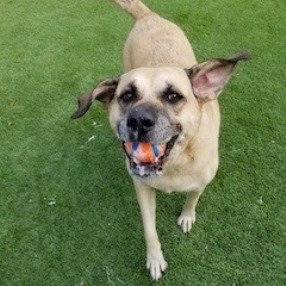 We feel that she is a great dog, but with our busy life, combined with a loud household she has developed some behaviors that are stressful to us and we cannot manage her the way she needs and deserves. 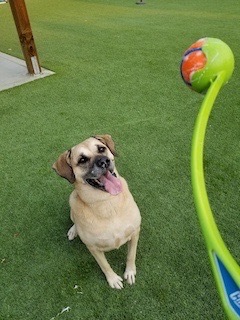 Play: Moxy loves to play fetch or ball. She will chase it far and bring it back or just be happy in the house catching it out of the air. We had 4-5 chuck it balls around the house and she loved to chew them or bring them to you to play a game of catch. In a field or park she will run full speed to get the ball. She loves ball. It is her favorite. She also enjoys tug: We had 1 or 2 in her toy basket. She would go retrieve them to play or if you ask her “where is your tug” or “go get your tug”. She is a tough competitor, but always drops it on command. Rare to actually beat her. She loves to swim. We have brought her to the river (nothing rushing) and the ponds where we hike. She will swim forever. So be prepared. We have a very long leash we leave on her to make sure we can get her back in. She will chase floating buoys if you throw them. She also just likes to play. Meaning run around the house at crazy speeds. Usually ends with her grabbing a ball or tug and bringing it to you. She loves to go out on walks and even hikes. Most our play was ball or tug related. Old, young, big or small she loves anyone that will play ball or tug. Animals: Moxy does not live with cats. We have them next door and she barks at them through the fence from time to time. She sees them on walks and ears go up, but no barking, lunging or obsession. Moxy has been mixed with other dogs. She is working with Caity at Balanced Behavior and spends hours with the pack. 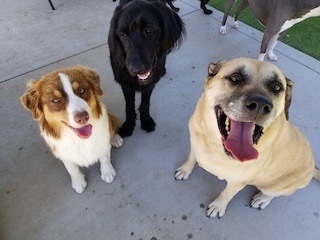 She is not wanting to play and will let other dogs know that, but will co-exist with them. She is sometimes reactive on the leash towards dogs that are pulling towards her or lunging at her. But even that is hit or miss. We were working to get her a friend and why we had her weekly at doggie day care. She lives with 2 Guinea Pigs and a hamster. She never gets to be with them face to face, but never jumps up or seems to care about them. Hamster ball has run into her in his ball a few times with zero issues. She is very respectful. Walk/Commands/Leash: Moxy is very well trained. She has had months with a great trainer, Caity at Balanced Behavior. She walks very well on the leash and actually off the leash too. When on the leash she will “heel”. Never pulls or lags. Stays right alongside of you. Very, very easy to walk. Over time we started to walk and hike with her off the leash. She will not go off trail much and stays with you. She will stop to smell here and there when off leash and is in no big hurry, but keeps up. When on the leash and you stop she will “sit” when asked. She knows “sit”, “down”, “wait”, “ok”, “drop it”, “give it”, “heel” and “stay” very well. She recently learned “bed” and does pretty well with it. She loves to walk and hike. Behavior/Environment: We have 2 boys and the house’s volume and energy has increased a lot. I think this is not good for Moxy. She is not a fan of loud noises. She will usually leave and try to find a less stressful place in the house or yard. She is not freaking out or having major anxiety, but we can tell she does not like it. She is a big lover, but it takes time to warm up. When we got her for the 1st month we got very little “pet me” or “cuddles”. Now she is wanting it more than we can provide. When she wants pets and love she is open to it all. I think a home with a little less commotion and energy would be great. We are gone a lot on weekends and at work all day and she would love someone home more. She has had a house sitter and does fine with her. She would stay at our house. She is not a runaway type of dog. She does not leave if front door is open, gate or garage. She is a home body. She has never dug in backyard or destroyed anything. She does great with positive reinforcement and will be submissive when in trouble. She has had the great pleasure of working with Caity at Balanced Behavior. She is awesome. She did trainings with her and for the last few months has gone to daycare 1 day a week. She loves it. Caity and her staff have her in with all the dogs for 2 to 5 hours every week. She doesn’t play but is not aggressive towards other dogs. Moxy will be missed! We love her! She deserves a less stressful home, owners that are home more and all the hugs and kisses we used to give her! The Vet: She is not a big fan. It can be very stressful for her. She can be very defensive. She has on her vet notes : NO TEMPERATURE. We started to muzzle her to be safe. For the 1st 3 years we did not do that, but the stress she was in and the vet it was just easier. She is not a fan of the muzzle, but it is most likely best. Nails: No issue getting her nails cut. She does not love it, but does not fight it. She DOES NOT like the groomer putting the noose/leash attached to the wall around her neck to do her nails. Our groomer had one person hold leash and other do nails. No issues. Baths: She does not mind the baths. We do them in back yard and at the self-wash place. She is fine with either. Never had her groomed. No sure she would like that. Health: Moxy is in great health overall. We just had all her blood and urine tested, plus a full examination. She is a little overweight. She is on Pronin for incontinence. It was not a problem for the 1st year or so. We think it could be weight related. The Pronin works great. Just goes in her food. Very easy. We have been down to 1 tablet each feeding. We even do some mornings without it. No issues. She is a little susceptible to ear infections. So, we recommend ear wash once a week and same day as any swimming.